1) Soak gelatine till soft. Heat Drambuie with gelatine until dissolved. Add sugar then juice. Cool to 30 °C. Place raspberries into prepared moulds. Pour jelly over. 2) Semi-freeze. Release from moulds and reserve in freezer, ready for assembly. 60 gms Callebaut "Pailleté Feuilletine"
1) Melt the chocolate to 50 °C. 2) Mix with Feuillatine then spread on a plastic sheet. Place another on top then roll out to 2 mm. thick. Set. 3) Cut discs out and reserve. 4 gms cocoa powder Callebaut "CP"
4) Spread thinly onto silpat mat, pattern to the required taste then place onto baking sheet and freeze. 2) Put icing sugar, ground hazelnuts, flour and eggs into bowl and whisk till light in texture and colour. 7) Once cool, cut into strips, soak with Drambuie flavoured 1:1 syrup and line moulds. Reserve. 100 gms ground hazelnuts Callebaut "GNT"
4) Either pipe in discs or spread with levelling tool onto silpat mat and bake for 15 mins. 5) Once baked cool , set discs to fit inside mould and reserve till assembly. 6) Pipe into the prepared moulds. Chill. Mix all the ingredients together and heat over a Bain-Marie to 85 °C, stirring all the time, then whip till nearly cold. 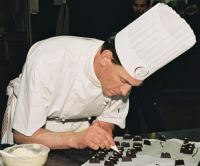 401 gms Milk Chocolate Callebaut "823"
8) When nearly mixed in, fold the Pate a Bombe in. Pipe into moulds. 6) Glaze and decorate accordingly.